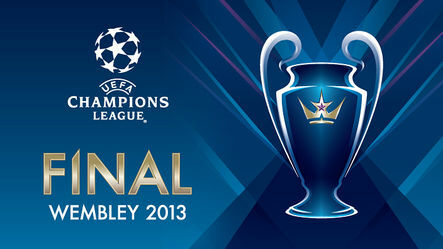 It’s the Champions League semi final draw that UEFA wanted. It’s the Champions League semi final draw that every neutral wanted. Put aside your skepticism towards a draw that has, for the second season running, facilitated the potential for an El Clasico final for a moment. These are the four best teams in Europe. Not once in the past decade has that been arguable; this year it is incontestable. In previous seasons three of the four semi finalists have been leading clubs in Europe, but there has always been a weaker side in the lower tier of the top table to make up the numbers. Last year – Chelsea. The year before – Schalke. Even in years before that – Lyon, Arsenal. Not that they are significantly inferior sides, but that most of them have had to adopt tactics to stifle the opposition – think Real Madrid against Barcelona in the semi final first leg two years ago, think Chelsea against Barcelona and Bayern Munich last season – rather than relying on their own class and pedigree to succeed. This year provided no lightweight quarterfinalist, and accordingly it has produced two semi finals packed full of prestige, pride and politics; four teams who have an equal chance of winning the competition. The two leading leagues in European football, the two domestic champions of the previous year and the champions elect of this year. Due to the nature of the latter stages of the Champions League as a knockout competition, this doesn’t tend to happen – not often in international football either. It would not be fanciful to draw an overriding analogy at this juncture between the worlds of tennis and football. 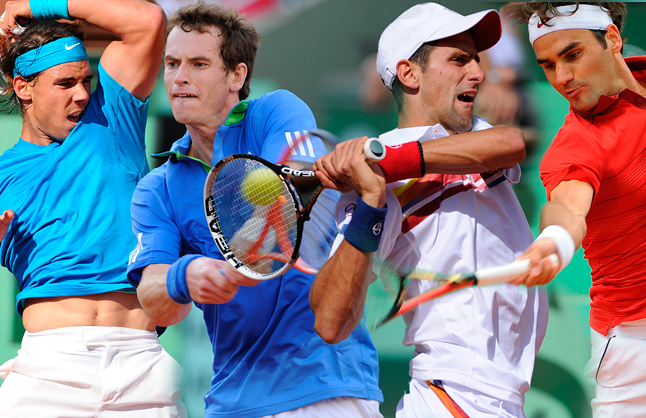 Between the 2011 French Open and Wimbledon 2012 the four leading players in world tennis – Novak Djokovic, Rafael Nadal, Roger Federer and Andy Murray – contested the semi finals of a Grand Slam three times. They are totemic figures in the tennis world – the class and ability that all the stragglers aspire to replicate – just like the big four of European football in 2013. So how do these proponents of the second Golden Age of tennis translate to their footballing cousins in the last four of this season’s Champions League? The first tie pits the brute force and sheer will of Novak Djokovic against the era-defining aesthetic elegance of Roger Federer. A clash of culture as much as a clash of styles; Bayern and Djokovic on form are relentless, whilst Federer and Barcelona, periodically doubted, can point towards a style of play and winning mentality that has brought 17 Majors in 10 years and 15 trophies since 2009. The cult of Federer conforms with the Barca motto of més que un club; keen observers are often left awestruck by the Swiss’ astonishing groundstrokes and imperious forehand, and conversely the Catalan club’s monopolization of possession and high pressing. Both represent the benchmark of achievement, style and reputation in the modern era of their respective sports. Their influence even transcends this era, with both recognised as amongst the greatest in the history of their fields. But questions and doubts surround both camps – Barca have, aside from an astonishing 90 minutes against AC Milan, underwhelmed in the latter stages of the Champions League, whilst the relentless Fed machine has slowed down considerably since 2010. Vindication is provided, though, by Barca’s outstanding domestic form this season, which saw them gain an unprecedented 55 points from the first 57 available, and Federer’s unexpected triumph at Wimbledon last year. Yet those nagging doubts have been accentuated, at times accelerated, by the form of rivals. Bayern’s continental form since 2010 has been impressive – 2 finals, and a semi-final appearance this year – whilst Djokovic has won 6 Grand Slam titles in the previous two and a half years, a period defined by 43 consecutive victories in the first half of 2011. Djokovic and Federer have been involved in grueling ties in this period too, with momentum rapidly shifting between the two. It was Federer’s class which ended Djokovic’s astonishing winning streak in the semi finals of the 2011 French Open, before Djokovic saved two Federer match points in the semi finals of the 2011 US Open on the path to victory. For all the recent intrigue between Djokovic and Federer, Barca and Bayern’s rivalry remains grounded. It will only take 180 minutes of a swinging pendulum of momentum to change that. Recent new kid on the Grand Slam block Andy Murray faces the sheer weight of power and history in 11-time Champion Rafa Nadal. Murray is perhaps not as universally revered as his footballing contemporary, Borussia Dortmund, but his potential excites as much as that of Jurgen Klopp’s charges. Having finally broken through into the upper tier of European football after years of domestic dominance, Dortmund’s breakthrough echoes that of Murray’s valiant attempts at Grand Slam glory which culminated in the US Open title last September. Murray’s game has evolved substantially in the past year as he has begun to shed his dogmatic, predominantly defensive base line game, for a more progressive and attacking blend. For coach Ivan Lendl, see Jurgen Klopp. Perhaps the pair do not make such natural bedfellows, but their influence on the two is undoubted. On the other side of the net Nadal is slowly working his way back to the top of world tennis following an injury ravaged 2012. Real, likewise, so dispiriting in the first half of the La Liga season have steadily improved, most prominently in Europe where they have survived onslaughts from Manchester United and Galatasaray to reach this stage. Nadal, like Madrid, is not as idolised or deified as Federer, or Barcelona. It is reflected in a brutal style of play which subjects the opposition into submission, rather than with delicate brushes across an artistic tapestry. Dortmund and Madrid have already met in this year’s competition, with the Germans causing shockwaves to resonate across Europe as they emerged unscathed from both duels. Their most high profile recent encounter however, remains the semi finals of the 1998 Champions League tournament. Fittingly it was Madrid who prevailed back then, as Nadal often did early in his career against Murray. The home of football sits 13 miles north of the home of tennis. Wembley is what the Centre Court represents to tennis, and provides the perfect backdrop to the finale of this narrative. Dortmund, like Murray, are up against it. Victory over pretender Murray (Dortmund), would pit Nadal (Madrid) against his two arch rivals in the tennis world (European football). Whilst Nadal’s Grand Slam record over Federer is imperious, Real Madrid’s own form against Barcelona has improved as the Mourinho era has unfolded. The same cannot be said of Nadal’s record against Djokovic, nor Real’s against Bayern. Los Blancos were humbled in a penalty shoot out at the Bernabeu at this stage last season, surrendering a 2-0 advantage gained in the first 15 minutes of the second leg. Djokovic has been similarly dominant over the Spanish matador, notably defeating his rival in six finals across three different surfaces in 2011. Bayern and Dortmund’s duopoly over German football has been a fascinating subject in recent years, whilst Djokovic and Murray have formed a rivalry as potent as any other, and one that has contested three Grand Slam finals and one semi final since 2010. Historically Bayern, and Djokovic, have dictated terms. Yet the world seemingly pines for the ultimate El Clasico in the final of the Champions League at Wembley. Likely to be the denouement of Jose Mourinho’s time in charge of the Madrileñans, the setting could not be grander. Nothing in sport comes closer to recreating that sense of rivalry and history between the Spanish duo as Federer v Nadal, whose clash in the final of Wimbledon 2008 set the template for epic. 180 minutes; 5 sets. Four rivals stripped bare, toe to toe with one another. Immortality awaits the victor. This entry was posted in Previews and tagged barcelona, bayern munich, borussia dortmund, champions league, djokovic, federer, grand slam, klopp, lendl, mourinho, murray, nadal, real madrid, tennis by James Dutton. Bookmark the permalink.